October 19th is the day I planned to attempt a BQ in St. Louis for the RNR marathon. Meniscus soreness haulted my training, but it did not stop my desire to enjoy life beyond running. 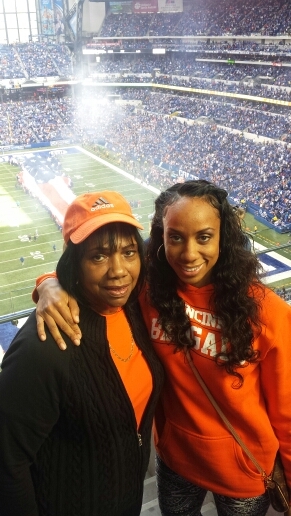 Mom and I drove to Indianapolis in anticipation of a competive match up between two division leaders. 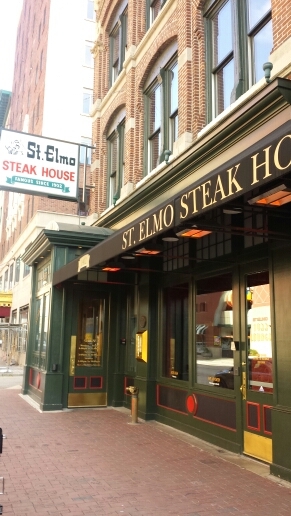 We made reservations to St. Elmo for a pre game meal and the added convenience of valet parking during the game. Their prime rib chilli and chicken breast sandwich hit the spot. I earned a pass to eat two entrées after running 8 miles in misty rain on Saturday. I should have sent a photo to my oldest brother who always asks if I’m hungry, or tells me I need beans and cornbread. 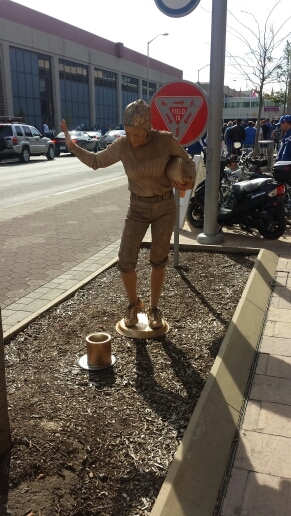 A short walk down Georgia street to Capitol led us to this Human Statue. I want to be her for Halloween. I love the architecture of Lucas Oil Stadium. Smoot Construction Company did an excellent job in building it! There were plenty of Bengals fans in attendance. We supported one another as the Bengals only made 2 first downs in the first half. 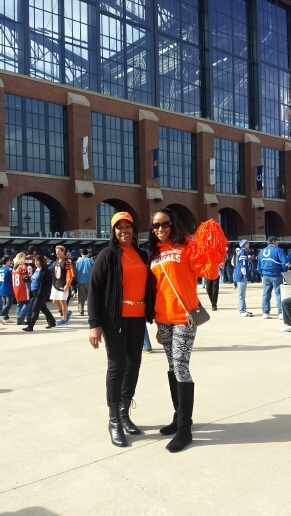 Mom and I were more entertained by a very “happy” Bengals fan who I gifted a pompom. I immediately regretted doing so after she threw it on a man’s head and dangled it in a woman’s face. The last thing I wanted to see was a brawl in the stands. Besides, the Colt’s defense was putting a hurting on every Bengal play attempt. The Bengals were stuck making punts and being completely shut out from scoring. 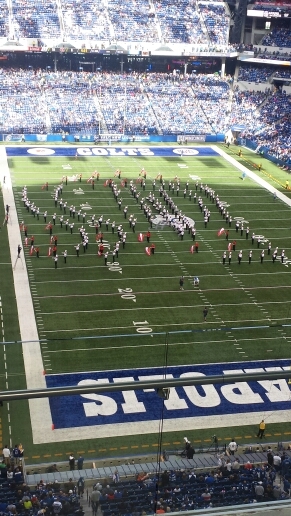 The UofL Cardinals marching band performed at halftime. It was getting chilly, but the retractable roof remained open. That combined with a losing score were our cues to make an exit. 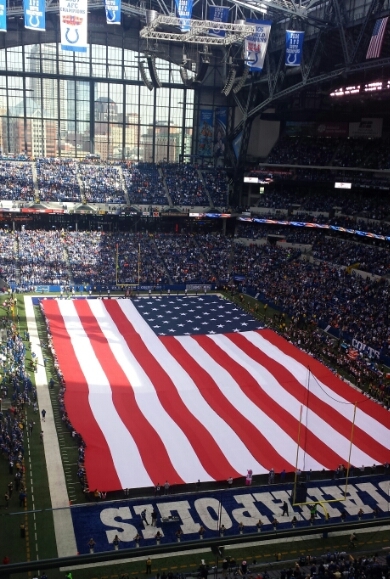 Of course, the Colts fans had a lot of trash to talk. No worries over here. All Colts grow up to be Broncos! Falling back on the pressures of marathon training has allowed me to focus on other goals. Everything is falling into place. Stay ready so you don’t have to get ready. You never know where life is going to lead you! 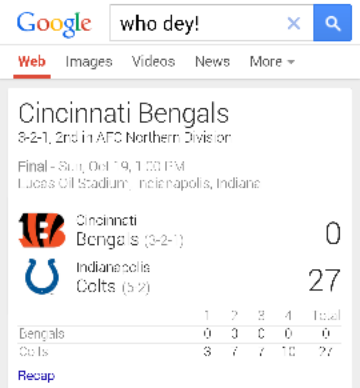 This entry was posted in Cincinnati, football, Indiana, Indianapolis, Louisville, Travel. Bookmark the permalink. Good girls never finish last…. Oh please! I thought u didn’t believe in “Luck.” I figured u would be a Broncos fan since ya boy left. I hear you are doing well and I am happy for you👏. Keep those grades up 🎓and hold that job down 💵. We will always have a bond, and I love you too NCM 💜. Glad you’re still having fun! Ha, love the trash talk. I got to do that with some Cowboys fans when my Browns played here the other year. Heyyyy Scott! Competition never bothers me. You win some and you lose some!